The titular protagonist of the animated dramedy Bojack Horseman took to Twitter to show off the “inedible” fruit arrangement Netflix sent the 55-year-old actor that also held an announcement he would be returning to the streaming service for a sixth season. About BoJack Horseman season five from creator Raphael Bob-Waksberg: All right, season five of BoJack Horseman, here we go. Has it really been five seasons? Where does the time go, huh? Anyway, this season finds BoJack starring in a new TV show called Philbert, playing a character with disturbing parallels to BoJack’s real life, echoes that force BoJack to confront himself and his past in ways large and small, but the main thing that happens this season is Diane gets a haircut. We spent a lot of time figuring out the haircut — the style, the volume, the bounce, the sheen — and we’re really proud of the way it came out. We really think people are going to like this new season, and Diane’s new haircut! Season 4 of BoJack Horseman launched globally on Netflix on September 8, 2017. Will Arnett voices BoJack, the failed legendary ‘90s sitcom star from the favorite family sitcom Horsin’ Around, who has been trying to find his way through a muddle of self-loathing, whisky and failed relationships. 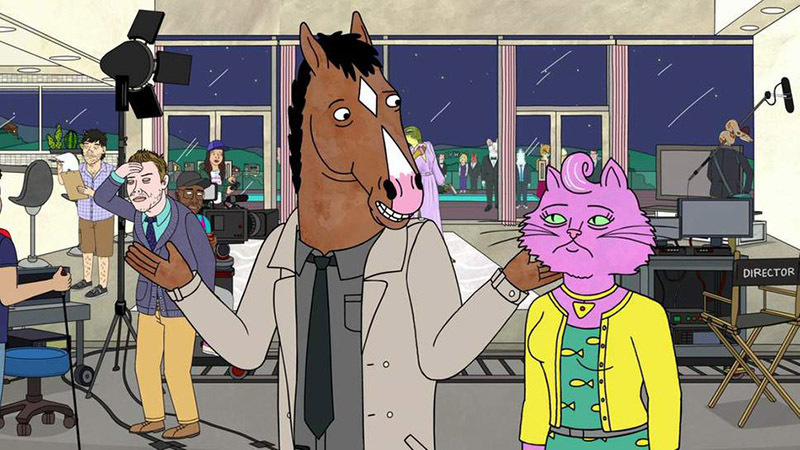 Now, in the presence of his human sidekick Todd (Aaron Paul) and his feline agent and ex-paramour Princess Carolyn (Amy Sedaris), BoJack is primed for his comeback. BoJack Horseman season five launched globally on Netflix on September 14 and received rave reviews from critics and audiences alike, currently holding a “Certified Fresh” 100% rating from critics on review aggregate Rotten Tomatoes.